Any other video player for Mac recommended? I recently downloaded the new Mac operating system El Capitan and it feels great. However I soon realize that my QuickTime crashes often after the upgrade. I think I need a powerful media player for Mac. Mac, by default, supports limited video formats, which means that some other popular formats like MKV, FLV, WMV etc are out of luck. Considering the fact that videos movies come in the sheer amount of different formats, Mac users who are passionate about watching movies or videos are really in need of a robust Mac media player which host the most video formats. If you're looking for the best video player for Mac, you search ends here as we list top five best Mac video file players to play any HD 1080p/720p UHD MKV, WMV, FLV etc on Mac (MacBook/MacBook Air/MacBook Pro/iMac/5K Retina iMac more). In addition to looking for the best media player for Mac, another way to play certain video files like MKV or WMV on Mac smoothly is to convert the video first. In this case MacX Video Converter Pro, a professional video converter for macOS, is an excellent helper. Built in 370+ codecs, it can easily convert videos from MKV, AVI, WMV, FLV etc to Mac supported formats. With world's No.1 fast speed and no quality loss! 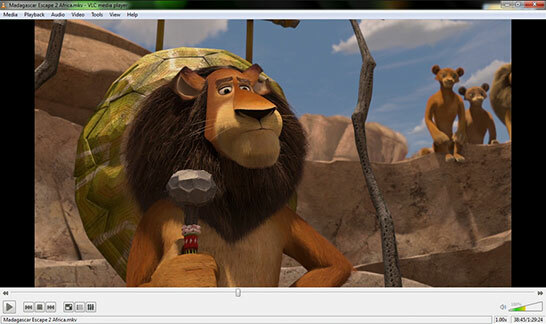 Mac users can play any videos smoothly without third-party video movie player for Mac. Another plus is that it helps to free download HD 1080p/720p 4K UHD from YouTube, Vevo, Vimeo and 1000 more online site to Mac. There are plenty of Mac video players such as VLC, QuickTime, XBMC... But the top best movie players for Mac should excel others in speed, efficiency, compatible formats, quality while match perfectly with the Mac OS X (Mojave incl.). Based on those factors, we select top five best media player for Mac. 5KPlayer may be new to many users, but it still gets the gold medal for video playback on Mac (or Windows). As a free HD video player on Mac (MacBook/MacBook Air/MacBook Pro/iMac/5K Retina iMac), it works seamlessly with almost all the formats you'll need, including videos in MKV, WMV, FLV, AVI, MTS, MP4 etc and even DVD or music in MP3 AAC APE FLAC, with HD 720p/1080p UHD 4K/5K in high quality. A highlight of this best Mac media player is that it features AirPlay receiver/sender to help users stream movies videos from iOS devices or to Apple TVs. 1.Wide-range of supported formats can be played. 2.HD 720p/1080p/UHD 2160p 4k/5k/360 degree video playback on Mac supported. 3.High quality and neat UI of the best video movie player for Mac is well received. 4.Videos playback, download (1000+ sites supported) and airplay supported. 1.Blu-ray videos are not supported. 2.The language options of the Mac media player are rather limited. Among the top video music player for Mac (MacBook/MacBook Air/MacBook Pro etc), we also have VLC media player, a well-known free audio and video file player for multi-platform, including Mac OS X, Windows, Linux, Android, iOS. It supports a compendium of file formats like MPEG, AVI, WMA, WMV, MP4, WAV, FLV, FLAC and more. Also you can use this Mac video player to play DVD, Bluray, VCD and CD. 1.Almost any media file can be played on VLC. 2.It is available on several platforms. 1.It may not be a good MKV player for Mac as many users are complaining about VLC won't play MKV problem. 2.The features and settings are limited to basic use. 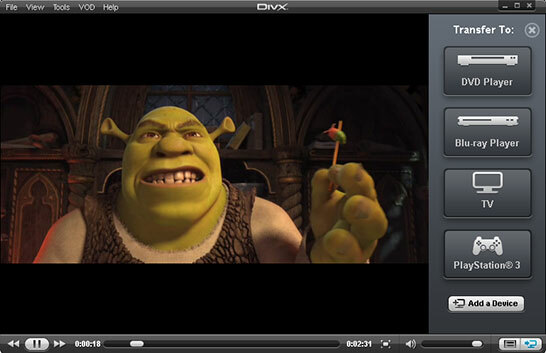 DivX is another good media player for Mac, especially for videos in high resolutions. As it's name suggests, it's among the best 4K ultra hd video players for Mac by supporting high-quality playback for the most popular video files online, including DivX, MKV and HEVC up to 4K. Also it integrates Mac media player, video converter and DLNA media server into one. No wonder that it's one of the best HD MKV players on Mac. 1.HD 1080p/720p, 4K UHD videos supported. 3.HD video movie player for Mac also a video converter. 1. 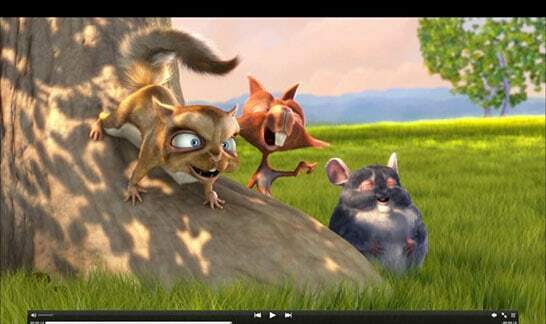 Malware and virus bundled with Divx, attention! 2. No Bluray playback ability available. 3. It may cause excessive consumption of resources. 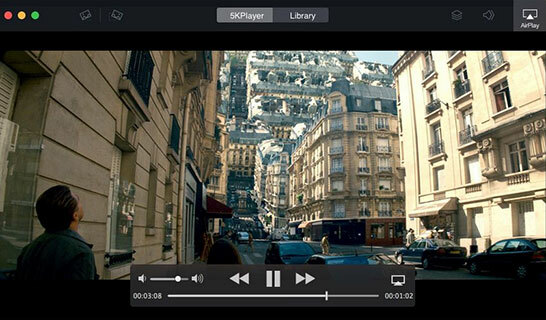 MPlayerX also delivers seamless video playback on Mac. Developed by MPlayer and FFmpeg, it's allowed to play almost all the media formats, including MKV, WMV, FLV, AVI etc on Mac OS in HD quality. With the clear and smooth high-quality video playback, no wonder it's a popular media player for many Mac OS X users. Besides, the URL video playback ability makes it a good movie music player of online videos from YouTube, Vimeo and many others. 1.Equipped with FFmpeg, it's a best video player for Mac to host various video formats. 2.It's able to identify successive videos placed in the same folder. 1.It has trouble to recognize the DVD menu when dealing with Video_TS folder. 2.Delayed soundtrack problem may occur on some OS X version like El Capitan and Yosemite. QuickTime Player comes last in our list of top movie player for Mac. Developed by Apple, it's apparently among the options of Mac media players (El Capitan or Yosemite) to play Internet video, HD movie trailers, and personal media clips. However, same as a Mac, the formats supported by QuickTime is very limited. 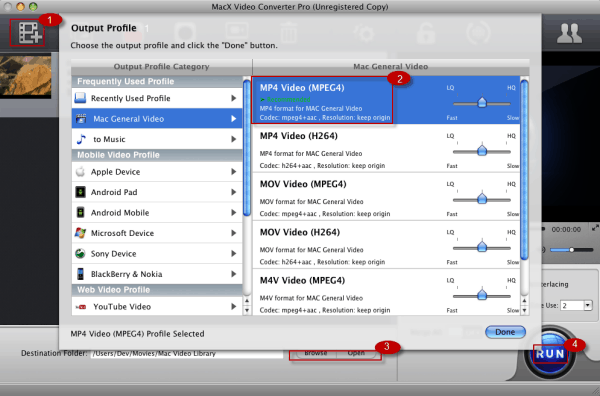 If you want to play MKV, WMV, AVI etc, you'll need a reliable video converter for Mac to convert the video files first. 1.Available for the latest Mac OS X, including El Capitan and also the latest Mac, like MacBook/MacBook Air/MacBook Pro/iMac more. 2.Video playback, record, edit and stream supported. 1.Popular video formats like MKV, WMV, 3GP, MTS, AVCHD, FLV are not supported. 2.Frequent update is needed together with the system upgrade. If you're not interested in any of the above HD video movie players for Mac and wanna stick with your current player, but have trouble playing certain type of video files on Mac, or if you simply want to transfer your Mac videos to iPhone iPad Android devices, the first mentioned Mac video converter MacX Video Converter Pro will help you play MKV, AVI, WMV and more on Mac in 4K/8K UHD or HD resolution smoothly on your Mac media player. Step 1: Free download this big-league video converter for Mac, or windows users, just go to the windows version. Launch it and click "Add File" to load the video files you want to play on your media player for Mac. Step 2: Select the output format and resolution you Mac movie player supports; to play videos on mobiles, choose the device from the list directly. Step 3: Click the output folder you want to save the output video by clicking "Browse" button. Step 4: Click the "RUN" button to start to convert the SD/HD/UHD videos on your Mac. Soon you can enjoy the videos on the Mac video player smoothly without any hassle.